501 Commons provides a number of professional development and training opportunities for nonprofit staff, executives, skills-based volunteers, and boards. Scroll down to see if any of these programs would be an appropriate fit for your expertise. Every two weeks throughout the year (with a break during the summer months) we host a series of 3-hour long training workshops for board members, prospective board members, and EDs/staff who work closely with their board. All sessions are held at Pacific Tower in Seattle's north Beacon Hill neighborhood from 9:00 a.m. to noon, although there is some flexibility if that exact time frame doesn't work. Do you have a suggestion of a new topic – or a different spin on one of the above topics – that board members should be trained on? Tell us! Contact Kendra Demuth at kendra@501commons.org to let us know what ideas you have. Once a month we hold a day-long workshop that takes a deep dive into thought-provoking subject matter that's crucially important to the sector. The Staff Development Coalition workshop series improves how staff members work with each other and with the communities they serve. Each session provides affordable staff and leadership development on topics such as staff retention, diversity and inclusion, cultivating empathy and emotional intelligence, building leadership skills, improving communication, handling difficult conversations, and de-escalating potentially violent situations. These topics are suggested and approved by the committee members and are especially important for nonprofits that serve diverse and vulnerable populations. We try to book these workshops several months in advance, so email kendra@501commons.org if you would like to learn how to get involved somewhere down the road. Learn more about becoming a 501 Talks Tech trainer, and contact jim@501commons.org if you have any questions or suggestions for future topics. 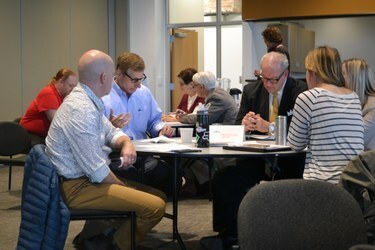 The Executive Director Forum is a unique opportunity for nonprofit EDs, CEOs, presidents, and artistic/managing directors to connect with their peers, share ideas, and learn from each other in a supportive environment. Generally, each session occurs quarterly and offers three roundtable discussion groups facilitated by three experienced leaders. The format of the forum allows attendees to circulate through all three topics and interact with many of the executives in attendance as well as our outstanding discussion leaders. We are always looking for executive leaders in the greater Puget Sound area who would like to be a discussion leader at an upcoming gathering. Email Nancy Long at nancy@501commons.org if you are interested in facilitating a discussion topic. Please reach out to us if you are a service provider, educator, experienced board member or executive, or public speaker with something valuable to share with our sector. We are especially interested if you have experience working with diverse audiences, marginalized communities, and underserved populations. We'd love to feature trainers from outside of King County who can work with nonprofits across the entire Pacific Northwest. Our sector also values education opportunities framed with diversity, equity, and inclusion concepts. Let us know your areas of interest by emailing kendra@501commons.org. Interested in further promotional benefits? Apply to join the Nonprofit Resource Directory! Our Directory partners have the privilege of having their training workshops listed on our popular calendar and occasionally posted on social media and e-newsletters.